674 Duke Street, Glasgow, G31 1JZ. To read more on the Ballochmyle Bar click here. Scotland's comedy entertainers clubbed together today and brought out a World Cup special. Comedians Mr Abie (left) with Benn Gunn on his right, and Tony Duncan (extreme right) handed over a two and a half foot World Cup cake to Glasgow's taxi-drivers children's outing. The presentation took place at the Ballochmyle Bar in Duke Street, Glasgow. The cake, which has a large ball made of icing as its centre-piece, is to be raffled among the pub's regulars. 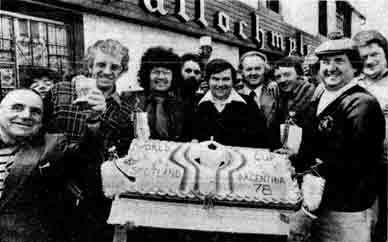 Also in the picture is the pub owner James Mortimer, who is in front of Archie McPherson of the BBC. Do you know anything about this pub? If so please contact us and I will view your comments.